Loyalty Man's winning margin of 2 3/4 lengths at Bendigo on Saturday was impressive enough - but it was not truly indicative of the dominance of the performance. Always travelling well on pace, Loyalty Man was clearly a class above his rivals but once in front he wanted to have a good look around - jockey Jake Noonan reporting that "he just kept trying to pull up." "If not for that he could've won by ten lengths!" Still unsure of what to do at only his fourth start, the promising son of Fastnet Rock was a close up fourth in the Gr.3 Bill Stutt Stakes at his previous outing and the stable have always thought highly of him. "He has always shaped as one of our better three-year-olds," Michael Moroney said, pleased with the ease of Loyalty Man's victory. "He is still green but it was a really good win and we are confident that there is a race somewhere at Flemington for him." A regally bred horse, Loyalty Man is out of the imported Imperial Beauty, winner of the Gr.1 Prix de l'Abbaye run at Longchamp on Prix de l'Arc de Triompe day. Also dam of the Gr.3 placed Ipswich, Imperial Beauty hails from the family of the big race winners Together and Jan Vermeer. 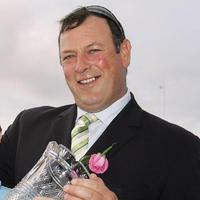 The Carbine Club Stakes is one possibility for Loyalty Man, a race which may also see Tivaci take his place - the High Chaparral gelding failing to run out the 2000m of Saturday's Caulfield Classic. "Damien (Oliver) said he just didn't stay," said Moroney. "He was travelling well but when it came time to let down he just couldn't finish off."